Arrested Development is an American television sitcom created by Mitchell Hurwitz which originally aired on Fox for three seasons from November 2, 2003 to February 10, 2006. A fourth season of 15 episodes was released on Netflix on May 26, 2013. The show follows the fictitious Bluth family, a formerly wealthy and habitually dysfunctional family, and is presented in a continuous format, incorporating handheld camera work, narration, archival photos, and historical footage. Ron Howard serves as an executive producer and the series' uncredited narrator. Set in Newport Beach, California, Arrested Development is filmed primarily in Culver City and Marina del Rey. Since its debut in 2003, Arrested Development, created by Mitchell Hurwitz, has received widespread critical acclaim, six Primetime Emmy Awards and one Golden Globe Award. Although it originally ran three seasons it attracted a huge cult following. So much so that in 2013 Netflix agreed to license 15 new episodes and distribute them exclusively on its streaming video service. 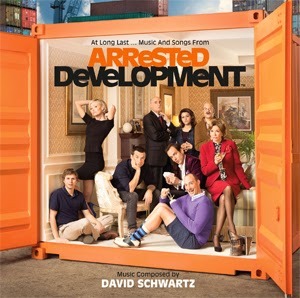 Arrested Developments composer David Schwartz selected the songs and score from all four seasons of the show, with a heavy dose of madcap ballads and ukulele themes for the soundtrack. Just Announced as fans of the show rejoice! !